The Green Bay Packers finished out their 1943 NFL season on December 5 in a game against a wartime combination of two clubs. The Philadelphia Eagles and Pittsburgh Steelers merged to become the Phil-Pitt Combine, popularly referred to as the “Steagles” due to the World War II manpower shortage plus reduced revenues. Earle “Greasy” Neale of the Eagles and Pittsburgh’s Walt Kiesling acted as co-coaches, and their styles and personalities clashed. Neither team had a history of winning, but the Steagles were in contention in the Eastern Division coming into the final week with a 5-3-1 record. HB Jack Hinkle was in the running for the league rushing title and two rookies, tackle Al Wistert and guard Bucko Kilroy, proved to be good acquisitions. Head Coach Curly Lambeau’s Packers had a better record than Phil-Pitt, at 6-2-1, but they had already been eliminated by the Bears in the race for the Western Division crown. 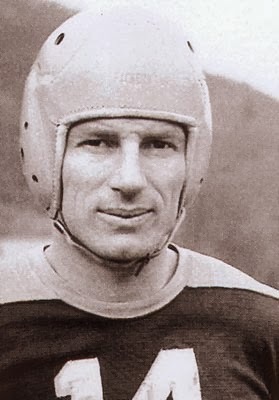 Star end Don Hutson (pictured above) was having a typically great season and had indicated that this would be his last game (a pronouncement that would prove to be premature). Tailbacks Tony Canadeo and Irv Comp were capable players, replacing the departed Cecil Isbell. Moreover, neither the Eagles nor the Steelers had ever beaten Green Bay (both franchises came into the league in 1933). There were 34,294 fans in attendance at Philadelphia’s Shibe Park. They saw the Packers score just five plays into the game. The Steagles had first possession and, after a one-yard carry by HB Johnny Butler, Jack Hinkle fumbled and LB Pete Tinsley recovered for Green Bay at the Phil-Pitt 31. Following an incomplete pass on first down, Tony Canadeo took advantage of a big hole and ran 35 yards for a touchdown. Hutson added the extra point and the visitors were in front at just 1:41 into play. After Hinkle returned the ensuing kickoff to the Phil-Pitt 21, the Steagles scored in four plays. QB Roy Zimmerman threw to Butler for a 37-yard gain and Hinkle ran 38 yards on a sweep for a TD. Zimmerman converted to tie the score. The Steagles got the ball back when DB Ben Kish intercepted a poorly thrown pass by HB Lou Brock at the Green Bay 41 and returned it five yards. The Packers stifled Phil-Pitt on defense, however, and Zimmerman’s 30-yard field goal try was blocked. Phil-Pitt advanced to the Green Bay 27 on its next series, but a Zimmerman pass was picked off by Irv Comp, who returned it 41 yards to the Steagles’ 39. Canadeo threw to end Harry Jacunski to get to the 14. HB Bob Thurbon knocked away a throw toward Hutson in the end zone and, following a short run by Canadeo, the Packers were facing third down. Brock got the ball on the next play and ran wide to his left on an apparent sweep, but then turned and threw to Canadeo, who was all alone in the end zone for a 13-yard touchdown. Hutson again converted and the visitors were back in front by 14-7 with less than two minutes to play in the opening period. The first quarter scoring wasn’t quite over, however. HB Ernie Steele returned the ensuing kickoff 27 yards to the Phil-Pitt 32. Zimmerman passed to Thurbon, who made a leaping catch at his 48 for a 16-yard gain. Following a run by Steele for four yards, Zimmerman went long for end Tony Bova, who outraced Hutson and HB Joe Laws down the middle of the field, gathered the ball in at the Green Bay 15, and reached the end zone for a sensational 48-yard TD. The play, capped by Zimmerman’s extra point, ended the eventful first quarter with the teams tied at 14-14. Early in the second quarter, Canadeo threw a pass that was almost immediately deflected and grabbed by end Tom Miller to give the Steagles the ball at the Green Bay 14. Jacunski blew through the line and dumped Thurbon for an eleven-yard loss and Phil-Pitt came up empty a few plays later when Zimmerman’s 31-yard field goal attempt sailed wide to the right. The Packers got a big play when FB Tony Falkenstein took off on a 59-yard carry to the Phil-Pitt 15. The Steagles held from there on defense and Hutson kicked a 25-yard field goal. The score remained 17-14 at the half. The Packers struck again early in the third quarter when Laws intercepted a Zimmerman pass and returned it to the Phil-Pitt 41. They scored in seven plays with Comp running for the last four yards around end for a TD. Hutson again successfully converted and the visitors led by ten points. It looked even worse for the Steagles when Hutson intercepted a long throw by Steele and returned it 45 yards to the Phil-Pitt 10 yard line. But the Packers came up empty when, electing to go for the touchdown on fourth down, Comp was instead pulled down for a nine-yard loss and the Steagles regained possession. Just before the end of the period, Jacunski intercepted a Zimmerman pass at the Phil-Pitt 19. Two plays gained seven yards and then Hutson caught a pass from Comp for a 12-yard touchdown. Hutson added the extra point to make it 31-14 for the visitors. The Steagles weren’t quite finished, however. After Thurbon returned the kickoff to his 40, Phil-Pitt went 60 yards in six plays, helped by a 15-yard personal foul penalty. QB Allie Sherman threw to Bova for a 13-yard touchdown and Zimmerman added the PAT. Green Bay’s lead was cut to 31-21. On their next series, the Steagles tallied again as they drove 62 yards. Bova made another outstanding catch, again on a long throw by Zimmerman for a 46-yard gain to the Green Bay four. Hinkle failed to penetrate the line while trying to go up the middle on the next play, but Steele followed up with a carry around end for the needed yardage and a TD. Zimmerman added the extra point and it was suddenly a three-point game with half a period to play. The crowd was excited, and that excitement increased when the Packers went three-and-out on the next series. However, Hinkle fumbled the ball away at the Phil-Pitt 38. Comp went right to the air, connecting with Falkenstein for 14 yards. On third down, Comp threw again, this time to Hutson in the end zone for a 23-yard game-clinching touchdown. He converted and the Packers won by a final score of 38-28. Phil-Pitt had the edge in total yards (318 to 278) and first downs (10 to 8). However, the Steagles hurt themselves by turning the ball over eight times, to two suffered by the Packers. Don Hutson, with two touchdowns, a field goal, and five extra points, scored a total of 20 points. Tony Bova had a big day catching the ball with three receptions for 106 yards and two touchdowns. Jack Hinkle (pictured at left) rushed for 59 yards in 12 carries in his bid for the league rushing title, although he also had the two critical fumbles. Green Bay ended up with a 7-2-1 record to place second to the Bears in the Western Division. The defeat knocked Phil-Pitt out of the Eastern Division race as they finished at 5-4-1 and in third place, a game behind the Redskins and Giants, who tied for the division title (Washington won the resulting playoff). Don Hutson led the NFL in pass receiving for the sixth time with 47 catches, and likewise in receiving yards with 776. He also topped the league with 11 TD receptions and 12 touchdowns overall (tied with Bill Paschal of the Giants) and was the leading scorer with 117 points. He was a consensus first-team All-NFL selection for the sixth consecutive year – and would come back to be so honored twice more before retiring for real in 1945 as the league’s pass receiving and scoring career leader. Jack Hinkle rushed for 571 yards on 116 carries for a 4.9-yard average, missing out on the NFL rushing title by one yard to Paschal. It was later found that a statistician’s error had apparently deprived him of 37 yards, but the erro remained uncorrected. Tony Bova didn’t catch a lot of passes, although his total of 17 led the Steagles, but he gained 419 yards to average 24.6 yards-per-reception and scored five touchdowns.